Make your Smartphone more secure. Control the permissions of your apps. Protect your personal information. Please note that SRT AppGuard only supports the Android versions from 2.3 to 4.4. An official support of the versions 5.x to 8.x is not available. You are tired of apps requesting too many permissions? 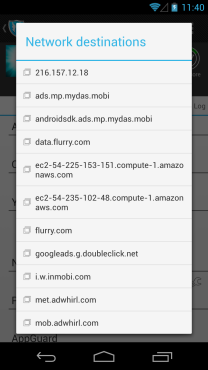 You are wondering why a flashlight app needs your contact data? Then, SRT AppGuard is the perfect fit for you! It allows to monitor other applications and to change their permissions after installation. 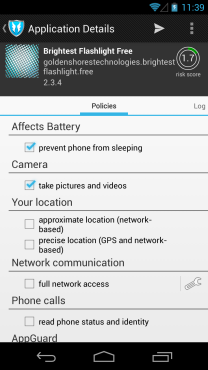 You can easily remove any superfluous permissions without rooting your device! The test version of SRT AppGuard is available for free and is limited in its functionality by allowing only four apps to be monitored. To enable the full functionality of SRT AppGuard a license key is required. You can order a license key via our shop. Customers who have already bought SRT AppGuard Pro via Google Play can get their license key at http://download.srt-appguard.com. Apps monitored with SRT AppGuard 1.x can be easily ported to the current version. Please note that you need SRT AppGuard 1.1.7 for being able to port apps. You can get version 1.1.7 by going to settings and searching for app updates. SRT AppGuard is an innovative Android application that raises the security on Android devices. As an everyday companion your smartphone saves more than just your contact data and your appointments, it may also have access to business documents as well as to confidential e-mail correspondence. Therefore, your smartphone has become a popular target for malware applications. SRT AppGuard makes a crucial contribution to the security of your smartphone, especially against the background of daily new arising scandals concerning applications that steal your personal data, create profiles, or simply spy on you. SRT AppGuard enables you to protect your personal data from malware-applications. 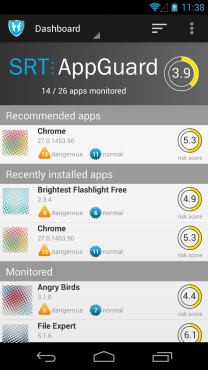 By monitoring these dangerous apps it prevents unprivileged leakage of sensitive data. It offers a dynamic permission management that allows you to configure the permissions of an app after the installation. To enforce a new permission configuration AppGuard adds a monitoring library to the target application. Configurations can be reverted at any time, in case you removed a permission that is crucial for the core functionality of an application. Monitored applications still receive updates as soon as they are available in Google Play. We developed SRT AppGuard considering the newest scientific findings from the domain of information- and application security. It provides full control over your installed applications without requiring a rooted smartphone or any firmware modification. It’s compatible with Android devices starting from version 2.3 to 4.4. SRT AppGuard requires a minimum set of permissions and doesn’t use or save any of your personal data. With an intuitive and well structured user interface even non-experts are able to control the permissions of their applications easily. Having trouble with your license key? Download the latest version of SRT AppGuard! security library is added to the application and the apps gets re-installed. Why do we lose the data when monitoring an app? lost once when uninstalling the app. Which permissions can be monitored with Appguard? location access, access to your contacts, calendars und messages. 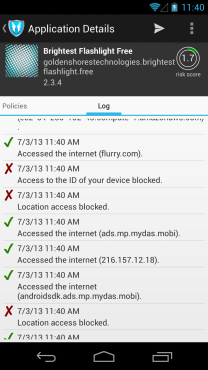 Which permissions can not be monitored with Appguard? functions called via native code. 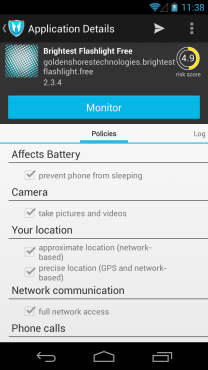 Why can system apps not be monitored? Why do monitored apps not show maps? Monitored apps currently don’t get access to the maps provided by Google Maps. Do monitored apps receive updates? can check for updates. A update via the Google Play Store app is not possible anymore for monitored apps. Can monitored apps from version 1.x be ported? prepare apps for migration. You can get version 1.1.7 by going to settings and searching for app updates. Why does porting monitored apps from version 1.x always fails? apps with the current version should work as expected. Is the app data lost when porting an app? Already monitored apps can be ported without data loss if SRT AppGuard 1.x has not been de-/re-installed before the apps have been ported.